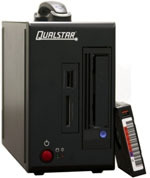 The Qualstar Q24 is designed to provide superior performance and value for backup, recovery and archiving environments. Feature-rich and compact in a 2U 19-inch rackmount form-factor, the Q24 offers outstanding capacity and throughput while providing a cost-effective solution. While compact in size, the Q24 offers throughput and capacity scaling by upgrading from one to two drives and from LTO-7 to LTO-8 technology thus offering tangible investment protection. Qualstar Q48 LTO-7 FC (Fiber Channel) Tape Library 4U 48-slot Autoloader Part# 900364-10-0. 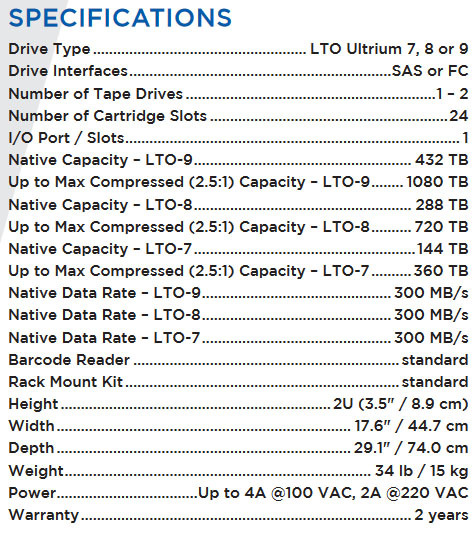 LTO-7 Tape Drive, 48-slots autoloader, 288TB - 720TB Capacity, takes up to four drives Qualstar Q48 Tape Library call for a Q48 LTO-7 Ultrium Drive Quote today. Qualstar Q48 LTO-8 SAS Add-on Tape Drive with Sled Part# 800-0030-0 This is the Add-on drive for the Q48 Rackmount Tape library from Qualstar. The LTO-8 SAS Tape Drive from IBM with Sled for adding drives to your existing Qualstar LTO-8 tape library. Qualstar Q48 LTO-8 FC (Fibre Channel) Add-on Tape Drive Part# 800-0031-8 This is the Add-on drive for the Q48 Rackmount Tape library from Qualstar. The LTO-8 FC Tape Drive from IBM with Sled for adding drives to your Qualstar LTO-8 FC tape library. Qualstar Q48 LTO-6 SAS Add-on Tape Drive with Sled Part# 800-0004-5 This is the Add-on drive for the Q48 Rackmount Tape library from Qualstar. The LTO-6 SAS Serial Attached SCSI Drive from IBM with Sled for adding drives to your existing tape library. Qualstar Q48 LTO-6 FC Add-on Tape Drive with Sled Part# 800-0005-2 This is the Add-on drive for the Q48 Rackmount Tape library from Qualstar. The LTO-6 FC Fibre Channel Drive from IBM with Sled for adding drives to your existing tape library. Qualstar Q48 LTO-7 SAS Add-on Tape Drive with Sled Part# 800-0021-9 This is the Add-on drive for the Q48 Rackmount Tape library from Qualstar. The LTO-7 SAS Serial Attached SCSI Drive from IBM with Sled for adding drives to your existing tape library.